After a couple of months and a few miles I’m happy with a pair of Adidas Supernova Sequence. They’re quite a narrow fit which suit my feet and wore in nicely after a week or two. Although the firmness under the arch was a bit strange at first it seems to have softened up now and I don’t really notice it. I’ve found the narrowness around the toe area means there’s not much leeway with sock choice although this isn’t too much of a problem as I prefer to run in really thin, liner type socks. Wearing thicker socks would probably require a shoe half a size larger. I did start to get a blister not long after wearing the Supernova’s but this was due to a seam in the sock unraveling and rubbing the toe. With a wider shoe this may not have happened so fast although the socks were overdue for the bin anyway! Grip is fine on pavements and tarmac and is pretty good on mud too. As a road shoe the sole isn’t really designed for mud and wet grass, but I run on this quite a lot so was happy to find they grip pretty well considering they’re not really intended for it. The upper is a very open mesh so any water goes straight in but also gets pushed out quickly. This does mean that it’s easier for grit to get into the shoe but, so far, this hasn’t happened while running. Before putting them on I always take insole out and shake the shoes out too to make sure there’s not muck or grit inside. This shouldn’t be a problem running just on roads. The open mesh upper is also quite drafty and when it was really cold my feet were freezing. I’m a bit of a wimp when the temperature drops. This feature will be great in summer though, and while I may overheat at least my feet should stay fairly cool. I’ve not had any overpronation problems so the Supernova’s are working just as well as previous heavy duty, motion control shoes. Although I’d tried them on the gait analysis machine before buying, I was still surprised that they worked well straight away. Perhaps as they’re narrow the control is more effective since there’s less room for the foot to pronate. This can happen in a motion control shoe that’s too wide. The snug fit is reassuring when running downhill and there’s no problems with rubbing. They’re also lighter than my previous shoe which is a real bonus. While they don’t have lots of cushioning, they’re comfortable enough and still let you feel some contact with the ground. Interesting findings! Thanks for sharing this post! I really enjoyed reading and learning more about your running. Hope your running continues to go well! Rating These shoes are absolute fboluaus! In my line of work I do alot of running, more than i care too. I bought these shoes and when they arived i was very pleased. 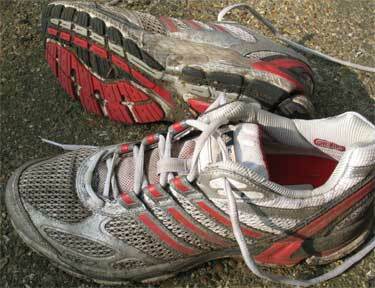 They are very light weight and very comfortable on the feet and very good for distance runing. first time i ran in them i did 5 miles and they wre awesome, had no feet pain afterwards at all. Second time i ran in them i ran a 10K (6.2) and they were like gliding over the pavement. These shoes are comfortable and I think a really good buy!